Recently, I’ve seen a couple of programs on TV about the beautiful and rugged Orkney Islands and when I spotted these, New in my local Tesco’s, Orkney Island made Oatcakes, I was caught up in the romance of the Islands. You get 8 oatcakes for 54p and measure about 3mm thick and about 8cm X 10cm at their widest. I have had them before but forgot what the taste was like and half expected a sweet biscuit taste but of course these traditional oatcakes are not sweet and have for sure an oaty, saltier taste. The texture is that of a biscuit and flavour-wise like a cross between an oaty unsweetened digestive and a cracker. Although almost wafer thin, they are strong enough to withold a decent spreading with a knife of whatever topping you’d like and also even in a dip. With a quality smoked salmon and bit of cheese they make a good base and add that little extra flavour that a cracker sometimes can’t give you. 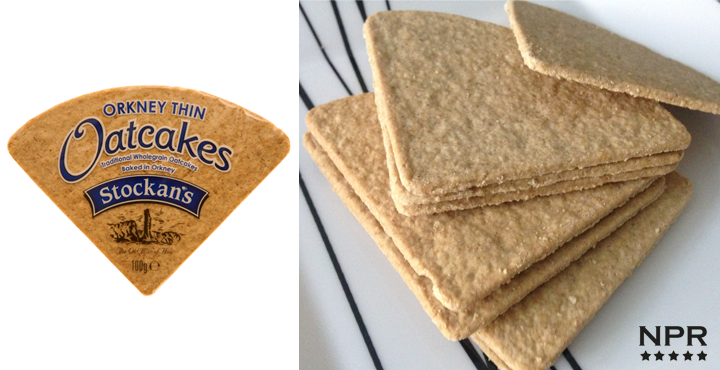 Overall, its hard to compare with other oatcakes on the market since we haven’t tested them yet, so as it is, its a good product.